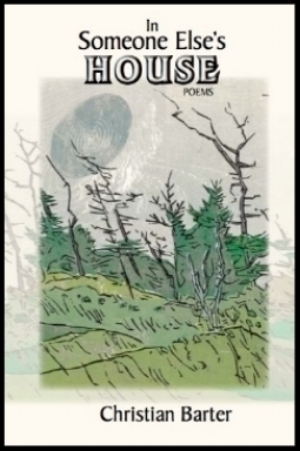 This award-winning book-length poem is a medley of voices in dialogue with each other -- overheard, remembered, and internal -- that represents a mind at work as it considers the destructiveness of human nature, the hypocrisy and artifice of the American dream. Voices from personal conversations, political speeches, Guantanamo detainees, news reports, and famous poets fill these pages, ultimately capturing a world of disrupted beauty and unrealized potential. There are poets who can bring us to tears; there are poets who can make us ponder vast societal and existential issues; there are poets whose irony moves us at once to ruefulness and to dark laughter; there are poets who fruitfully challenge our intellectual capacities. But Christian Barter is that rarest of writers, the one who can make us react in all these ways, and often simultaneously. Barter won't waste your time with archness, or meta-meta twiddling, or disposable Cool. He's a warmly funny and passionately thoughtful poet whose characteristic note is a hurt yet irrepressible joy. His lean and expert poems are the real thing: they have something to say, they are moving, they matter. Remarkably subtle and distinctive for a first book of poems, Christian Barter's The Singers I Prefer explores the diversity of voices comprising the world. Poem by poem, he individuates a variety of animate and inanimate subjects, including musical instruments, suicidal writers, German weapons from World War I, insects, Greek heroes, and himself in the first, second, and third person. Not content only to enact these voices, Barter interrogates their necessity, asking "Do we need all these voices?" His answers are as expressive of a unitary metaphysics as they are rich in imagination and emotional nuance.